HMHS junior Eve Jensen has self-published her first book. 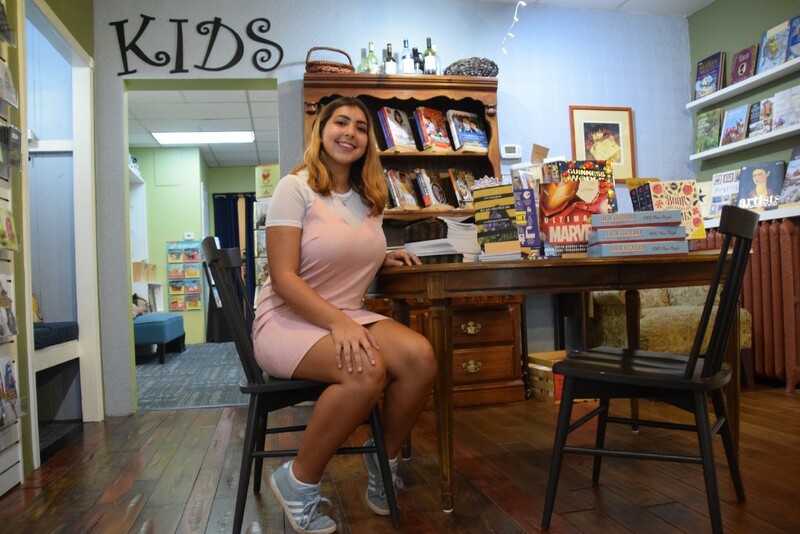 Jensen, a junior at Haddonfield Memorial High School, will celebrate her book’s late August publication with a reading at Inkwood Books on Kings Highway on Sunday, Oct. 8 at 4 p.m. She said the book, a collection of her poetry, is the first of more to come. Writing is in her blood, Jensen said. Jensen said she comes from a family of writers with a mother, uncle and grandfather who all share in her love of the craft. If she had to pinpoint where her love of writing stems from, Jensen said she can probably trace it back to when her father used to read to her before bed. She said it started with her father reading “A Series of Unfortunate Events” to her in Pre-K, and by kindergarten, she was the one reading to him. A voracious appetite for reading quickly translated into a love of writing, Jensen said. Poetry had always been more of a side project, Jensen said. She had taken a poetry course her freshman year, which culminated in a folder of finished works. This summer, she decided it was time to get a work in print, so she revisited the poems she had written when she was 14 and 15 and found some common themes. “The Girl Who Bled Ink” is broken into three sections, with poems categorized into the themes of youth, love and power. She said the youth section centers around her experiences coming of age, love is about love in all of its forms, and power encompasses both internal and external power struggles. She said her inspiration comes from anywhere and everywhere. She draws from her own experiences, pieces she’s read, photographs and “random bits of life.” Jensen never knows when inspiration will strike. The idea for her favorite poem in the book titled “Inevitable” came to her at 2 a.m. Abruptly woken from her sleep by an idea, Jensen said she found herself furiously scribbling a poem about a love affair between a photography student and an urban artist that just flowed out of her with no idea where the inspiration came from. Jensen’s freshman year poetry teacher, Sean Thomas, said he was struck by Jensen’s dedication to the craft when she was in his class. Thomas said Jensen’s poetry strikes a balance between being both personal and universal that makes her work connect with an audience. He said Jensen is his first student to date to publish a book. Jensen paid to self-publish the book entirely on her own with the money she earned working in town at Le Cafe Creperie and the farmer’s market. The book came about entirely of her own volition, having researched self-publishing online, and she did not take any money from her parents or anyone else. Since publishing the book at the end August, Jensen said her friends and family have shared in her excitement. Thomas bought a second copy the same day Jensen handed him the finished product. Looking ahead, Jensen said she wants to double major in film and English when she goes to college. Her hope is to one day write scripts for television or a screenplay for a film. In the meantime, she said she’s always working ideas for novels and screenplays. She said there’s a restlessness that builds inside her if she hasn’t written for awhile. Jensen’s book is available for purchase on Amazon, Barnes and Noble’s website and at Inkwood Books.